With tongue firmly in cheek, the Baby Loves Science series introduces highly intellectual science concepts to the littlest learners. Ruth Spiro is the author of the Baby Loves Science series, published by Charlesbridge. These adorably illustrated board books contain expert-reviewed science, yet are simple enough for the very youngest readers. Another new picture book series, Made by Maxine, will be published by Penguin/Dial beginning in 2018. Her debut picture book, Lester Fizz, Bubble-Gum Artist (Dutton), won awards from Writer's Digest and Willamette Writers and was a Bank Street College of Education Best Book of the Year. Ruth is a frequent speaker at schools and conferences, and recent presentations include the Early Childhood STEM Conference at CalTech and the Los Angeles Times Festival of Books. Visit Ruth on her website here. Irene Chan is the illustrator of Baby Loves Quarks! and Baby Loves Aerospace Engineering! She is also an art director, designer, artist, and amateur photographer. She currently lives in Atlanta, GA. Visit Irene at www.eneri.net. This colorful new board book uses a simple yet engaging story about a young girl and a bird to explore the wonders of flight, from a bird’s flapping wings, to a plane’s engines, to a rocket’s launch into orbit. In age-appropriate language, Spiro explains how each type of flight works -- and how young children can see those principles at work around them every day. Simple enough to appeal to the littlest listeners, but accurate enough to satisfy an expert, this charming new book is a great way to foster a love of science and a curiosity about the world! Illustrator Irene Chan’s bright and stimulating pictures are a perfect complement to this fun story, provide lots of visual interest for pre-readers. It’s a unique way to get kids thinking about the “whys” all around them from an early age -- and, as an added bonus for parents, it's a far more interesting read than the average baby board book. Highly recommended for age 0 to 3. Baby Loves Aerospace Engineering is an adorable introduction to the world of aerospace engineering. Your child will delight in bright and bold images as simple text explain the basic fundamentals of flight, from birds to planes to rockets. 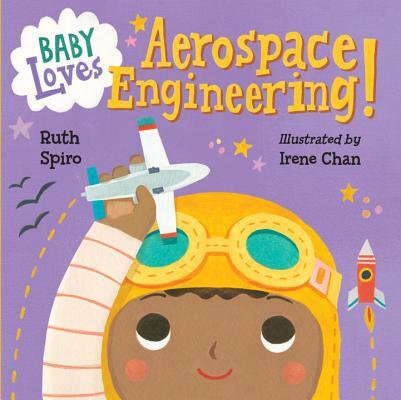 Ruth Spiro and Irene Chan's explanations and images will satisfy an expert and captivate your child in this one of a kind STEM board book.Practice this Comprehension Strategy-Retelling: Baby Loves Aerospace Engineering is a wonderful book to practice retelling with your child. After you read, let your child take a turn and read the book to you. Offer help if they need it but otherwise let them lead the way! This is a great strategy to build confidence in their 'reading' and strengthen their memory and inference skills.